Felt very relaxed and felt like they cared about my comfort..always checking. The doctor explained what he was going to doand explained as we did each procedure. I never felt any pain either. Felt very relaxed and felt like they cared about my comfort..always checking. The doctor explained what he was going to do and explained as we did each procedure. I never feltany pain either. 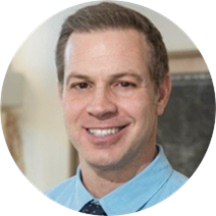 Dr. Christopher Kuranko graduated from Creighton University School of Dentistry in 2001. After receiving his DDS, Dr. Kuranko worked at Community Health Centers for eight years where he treated the undeserved and uninsured populations of Arizona and Nevada. Dr. Kuranko also provided dental services for Childhaven, the foster care program in Las Vegas. In 2010, Dr. Kuranko entered private practice working as an associate, and in 2013 realized his dream of buying a practice, Healthy Smiles Dental. Dr. Kuranko grew up an Air Force “military brat”. He moved to Spain when he was five where he finished high school. He completed his undergraduate schooling at UNLV, graduating with a BS in Biology in 1995. Before going to dental school, Dr. Kuranko worked as an organic chemist for Lockheed Martin. Throughout his career, Dr. Kuranko has been dedicated to excellence in his line of work. Dr. Kuranko is a member of the American Dental Association, Nevada Dental Association, Southern Nevada Dental Society, and Hispanic Dental Association. Dr. Kuranko is experienced in all aspects of dentistry. His philosophy is to provide the best possible care at the most reasonable cost. He is very gentle and caring, treating those in his office as a large family. His skills include root canal treatment, crowns, dentures, pediatric dentistry and more. In his time off, Dr. Kuranko enjoys traveling, playing tennis, snowboarding, landscaping and home improvement projects. He is very professional and excellemt team work. Going to a dentist can be difficult, but Dr. K and his staff are always very positive and helpful. Today's visit was no different. I left feeling better than when I got there. Definitely recommend this office! Dr. Kuranko and his entire staff were very friendly and professional. Today's visit was a cleaning and evaluation. Both went very well and both were thorough. I continue to highly recommend this doctor and staff. Dr. Kuranko and his staff are always very helpful, supportive and friendly. They don't overbook so there's no long wait time. I continue to recommend him to my friends and associates. I was very pleased to find a doctor so trustworthy and competent. I have always been terrified of the dentist and I walked into his office with great trepidation. From the pristineness of the office, to the welcoming manner of Elaine, the receptionist, to Maria, the absolutely kindest nurse I've ever met,I was thrilled! When I met with Dr. Kuranko, I was immediately convinced that he was the best dentist I have ever visited! He educated me as to the condition of my teeth and offered wonderful advice as to how I should move forward. Without doubt, I would recommend everyone in Las Vegas to Dr. Kuranko, I'm a believer!!! Great dentist. Super fast , gentle and explained everything! Dr. Kuranko was very professional and did a great job with my first crown. I’m very satisfied with the work. Dr. Kurango and staff are very pleasant and professional. They make you feel safe and advise you of each step of the procedure being completed. If you have a fear of going to the dentist, this is the place for you! Dr. Kuranko and each member of his staff are always professional, courteous, caring and exceptional. For me, it's always a very positive experience to visit Dr. Christopher Kuranko and the Happy Smiles Dental office. Beautiful job,good team !!! Thank you!!! Knowledgeable, friendly and no wait. Couldn't ask for more. Dr. Kuranko is a true gem! We are fortunate to have found such a caring and gentle dentist. Already made my next appointment. Fast and efficient, very happy with my visit. Tina and Elaine and the Doctor are so amazing. I’m bringing back all 4 of my kids! Thank you immensely!! Entire experience was fabulous! Great! Had a couple of fillings done and I was in and out in an hour. Dr. Kuranko was also very careful to make sure I didn't experience any pain during the procedure. Have been going to this office for close to 2 years. Pretty much the best Dentist I have been to and I have been to quite a few over 62 years. Everyone in the office is fantastic. Always friendly and witha smile on their face. Very accommodating also. Highly highly recommended. My experience with my recent (and first!) visit to the office of Christopher Kuranko, DDS was excellent. Being able to book my appointment online and filling out most of the forms made my pre-office experience tremendous. When I got to theoffice I needed to fill out a couple extra forms about cancellations and stuff, but it took maybe two minutes. I was seen even before my official start time! The technology they use for xrays and pictures was super cool. I was able to see things about my teeth I would have never been able to really understand myself. It helped me to also make informed decisions based off of Dr. Kuranko's recommendations for treatment. Dr. Kuranko himself performed my initial teeth checkup and he has perfect bedside manner in explaining any issues I had. Stacy performed my cleaning. BEST CLEANING EVER! My teeth felt and looked great after my cleaning. I'm actually looking forward to my six-month checkup. Stacy's bedside manner was also exquisite explaining anything I had questions about. I highly recommend Christopher Kuranko, DDS and his team. Dr Kuranko and his staff are amazing! So professional, knowledgeable, kind, friendly, accommodating, understanding and just absolutely WONDERFUL! I was very comfortable with the staff and Dentist. I will make him my permanent Dentist. The entire staff was extremely friendly and kind, from the front office, the X-ray tech to the dental hygentist and the dentist. Dr. Kuranko, spent time with me reviewing my X-ray's, and the additional pictures that he took of my teeth.He answered all of my questions with very clear explanations of his recommended treatment plan for my follow up appointments. Please know that, several of the staff members, including Stacy (dental hygentist) and Dr. Kuranko, stayed later than typical business hours to accommodate my appointment. The whole staff goes above and beyond! The office is also very clean and pleasant to visit as a patient. Very thorough doctor. Really good guy too. I'm glad I found him. Dr. Kuranko is very professional and knowledgeable in all facets of dentistry. His staff is very friendly, professional and knowledgeable as well. His concern for the patient is overwhelming! They accompanied my work schedule by seeing me after hours on a Friday. I was promptly seen and both the hygienist as well as Dr. Kuranko himself were very friendly. After taking a few x-rays, they effectively refilled one of mycavities and sent me on my way. The price of refilling it was way less than what another dentist was looking to charge me. I am so glad I went here instead! I was extremely pleased with the appointment. i was taken to the exam room at the exact time for my appointment. I was in and out of the office less than an hour and that included x-rays and a filling. Very impressed with the staff and their professionalism. The care that I received was of the utmost quality. Dr. Kuranko is highly skilled, keeps patients informed and walks the patient through every step of the intervention. I highly recommend!! As always, fast and excellent. Give Dr. Kuranko a chance coming from a person terrified of dentist. Just being in the chair brings back fears from long ago, but this Dr. makes you feel at ease. I initially went last week and Dr. Kuranko as well as his dental hygienist were very sweet, informative and explained in great detail what my treatment plan would be. They were able to squeeze me in today for the first partof my treatment and I am extremely happy with how easy the process was for me, how comfortable I felt and how attentive they were to my needs. I am extremely happy with my visit and will definitely recommend him to my friends and family. The staff are always very pleasant. Dr. Kuranko is compassionate and professional. Have known Dr Kuranko long before he became a Dentist and knew what an outstanding young Man he was and is, coming from a Military Family I believe only helped with his dedication to his skill, was so happy when Hedecided to open an office in Las Vegas! I have been seeing him since he started his practice here and have only good things to say about him and his staff, I have complete confidence in his opinion on my dental health care wheather its work that he performs or should he have to refer me to another specialist! Five Stars out of Five!! Dr. Christopher is kind, patient; if you are afraid of dentists, or extremely sensitive to pain as I am, Dr. Christopher is the right professional to treat you. Dr.Kuranko is the best! I've always been scared of the dentist until I started seeing him. He makes the whole experience as painless as possible! I would highly recommend him to anyone looking for quality dental work! Dr. Kuranko is an excellent Dentist. In spite of the fact that I has considerable work done, it was painless. He made sure that last minute alterations in my treatment plan were instituted on the spot and carried it through in the most professional manner! I love Dr Kuranko'd easy going nature. Smart, polite and Informative about the procedures, insurance coverage. He also followed up calling me to make sure I was ok- I think he's awesome?? All the staffs were very courteous, friendly, and presented a professional attitude at all time. I am very please with the services which I received. Definitely one of the best Dentist I've ever had the pleasure of bring treated by. Great manner and pleasant staff!